HONOLULU – Military personnel at Hickam Air Force Base captured a small snake yesterday afternoon in a maintenance bay near the airfield. Inspectors from the Hawaii Department of Agriculture were called and took custody of the foot-long snake. The snake was later identified as a juvenile ornate tree snake (Chrysopelea ornate) by a herpetologist at the Bishop Museum. Ornate tree snakes are mildly venomous and are related to the brown treesnake, which has devastated the ecosystem in Guam. Ornate treesnakes are native to South East Asia and their diet consists of lizards, mice, bats and birds. They are also known as ornate flying tree snakes for their ability to spring from tree to tree. It is not known at this time how the snake got to Hawaii; however, Air Force personnel are continuing surveys of the area. 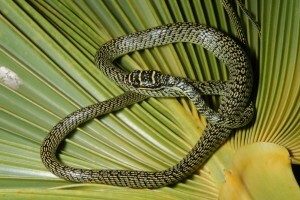 Photo of Ornate Tree Snake captured at Hickam AFB.